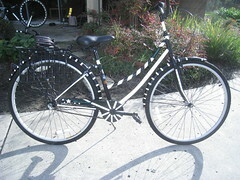 Above Above is the Pinstripe Bright Bike, with 1/4 inch thin strips that run along the length of the tubes. Below is the Caterpillar Bright Bike, with 1 inch bands that wrap around the tube and 1 inch dashed strips that run along the thin tubes. The kits come in 7 colors: Black, Dark Blue, Royal Blue, Red, Orange, Yellow, and White. See the photograph to see what each of these colors looks like in daylight and in headlights. Each kit is sized to be large enough for a 61cm frame with extra wide tubing, so in nearly every case, you will have extra materials that will give you room to play and experiment. 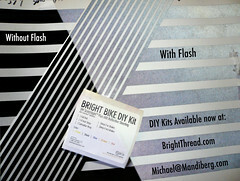 Bright Bike DIY kits cover your bicycle in easy-to-apply design-savvy ultra reflective vinyl for safety. 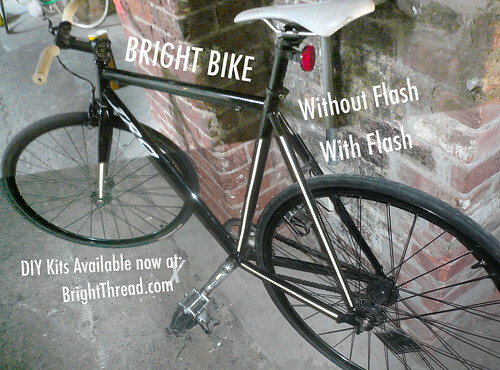 It is like covering your bike with a big stickers that turn ultra-bright in headlights. 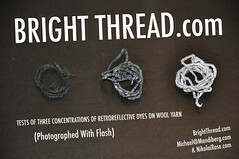 The retroreflective vinyl is the same material used on the backs of running shoes, but with colors. 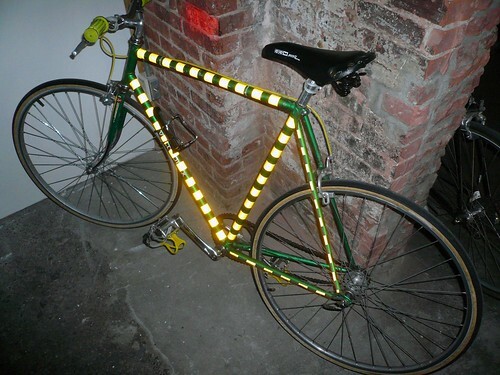 The kits greatly improve night visibility and thus bicycle safety. 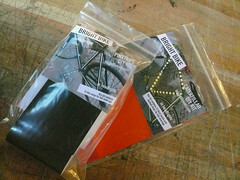 These kits are pre-cut and easy to put on. 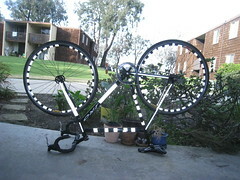 The Caterpillar has 1 inch bands that wrap around the main tubes, and in inch dashed lines along the fork and seat stays. 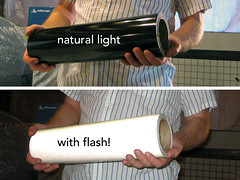 The Pinstripe has 1/4 inch strips that run along the outside faces of all tubes.